Is Poison Ivy Getting Nastier? The shiny three leaves of poison ivy. Photo by Susan Biddle/The Washington Post/Getty Images. Ahh, summertime. A long wilderness hike followed by a refreshing swim in the river followed by — music screeches to halt — a nasty case of poison ivy. Few things can ruin a good romp in the woods like the three-leaved plant, which, when touched, is known to cause oozing and itchy blisters. And with warmer weather, it’s out, it’s rampant, and some scientists say that climate change could be making it worse. A much-cited study published in 2006 found that a rise in carbon dioxide both fueled the growth of the weed and increased the potency of urushiol, the oil at the root of the rash. Poison oak and poison sumac also contain urushiol, and all three can cause the blistering rash. Airborne sap-coated soot can also get into the eyes, nose, throat and respiratory system, according to the National Park Service. That study involved planting PVC pipes into six plots of North Carolina’s 7,000-acre Duke Forest. Carbon dioxide was blown through holes in the pipes, which stretched to the tops of the tree canopies, while another control group of pipes vented normal air. Of all the plants, poison ivy was the hands-down winner, said Jacqueline Mohan, assistant professor at the University of Georgia and the study’s lead author. And the carbon dioxide appeared to make the plant as much as 30 percent more potent. Here’s how Mohan explains it. If you compare butter and olive oil, butter is more saturated than olive oil. Butter is made up of single carbon-carbon bonds, which translates to a denser substance. Oil is less saturated, and thus more fluid. The team found that when urushiol became more unsaturated — more like olive oil — it was able to interact more readily with human skin cells. “We found that under high CO2 conditions, the urushiol becomes 30 percent more unsaturated, or should we just say 30 percent more nasty,” Mohan said. A separate study in Wisconsin on the change in vine abundance over a 45-year period found the opposite. Using a data set published in 1959 on Wisconsin forests, researchers resurveyed the same area, using the same methods, and found that the amount of woody vines had not changed over the 45 years. This is despite the fact that atmospheric CO2 had risen globally by more than 20 percent over the 45-year study period. Not only that, but poison ivy in that forest was the only woody vine to decrease significantly over this period. So what might explain the discrepancy? One explanation is that woody vines like poison ivy might be limited more by freezing winter temperatures than they are fueled by carbon dioxide. “It may be too cold for the vines to take advantage of the higher CO2,” said Stefan Schnitzer, author of the Wisconsin study and related commentary and a professor at the University of Wisconsin, Milwaukee. Vessels that carry water inside the plant stems can freeze under cold conditions, ultimately killing the plant. Mohan added that a surge in white-tailed deer, driven by a drop in hunting, may explain the decrease. Deer are known to consume large amounts of the weed. To know for sure what role the CO2 played, you’d have to build fencing and study the poison ivy over time in areas untouched by the deer, she said. “But I’d be willing to bet the barn on this one,” Mohan said. Schnitzer stresses that he’s not disputing Mohan’s paper, which he calls “impeccable work.” But he and Mohan both say it shows the need for more research. Not so surprising, since people who study it can end up with terrible cases of poison ivy, pointed out William Schlesinger, president of the Cary Institute of Ecosystem Studies, who researches the impact of rising carbon dioxide on desert and forest systems and was a co-author the Duke Forest study. And the allergy is known to worsen with exposure. The fact that these two papers got set up as point-counterpoint could distract from understanding the bigger picture, Schlesinger said. What is well known, Schlesinger added, is that vines, such as kudzu and honeysuckle, grow exceptionally well under high CO2 conditions. Development also fuels poison ivy’s growth, he said, by creating more roadside edges, which the weed loves. The plant doesn’t do well in deep shade, he said. 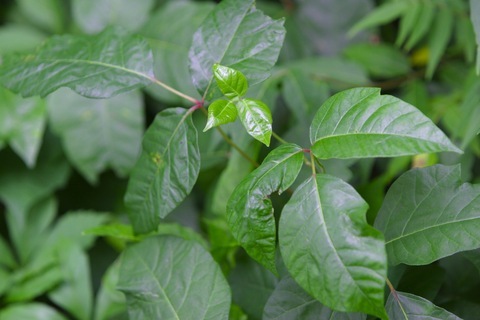 “Poison ivy is probably an extreme example of a plant responding to high CO2,” he said. There are medical consequences linked to the CO2 phenomenon, too. More plants produce more pollen, which means more particles to get lodged in the lungs of people who suffer from emphysema, hay fever and asthma. The increase in woody vines is particularly threatening to the role that trees play in tempering climate change. Vines like kudzu, for example, can smother the trees that are pulling carbon dioxide from the atmosphere. 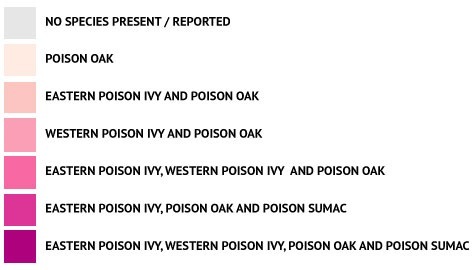 Correction: The map in an earlier version of this post had poison oak missing from several states where it is present, including Oregon, Washington, Nevada.